Looking for a private beach and a cold glass of rose´ to toast the setting sun with a lobster roll or plate full of fresh oysters in front of you? Look no farther. 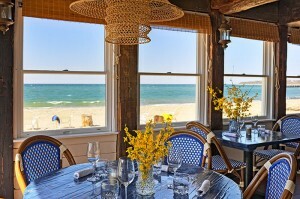 There’s a new kid on the Hamptons beach scene and she’s wearing a vintage bikini and serving up coastal and comfort food with couture cocktails. 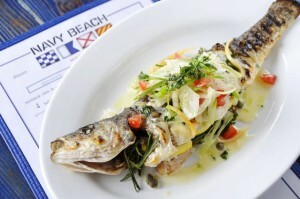 The new cool Hamptons hot spot is Navy Beach Restaurant in Montauk tucked off the beaten path where you can dip your toes in the sand and your taste buds in the latest fresh catch transformed by Chef Paul Labue. Formerly the Sunset Saloon on Navy Road, Navy Beach is the dream of two young couples Frank Davis and Kristina Davis and Franklin Ferguson and Leyla Marchetto. Frank brings his Cornell degree as well as Wall Street acumen to match Franklin’s restaurant management experience and taps into Kristina’s design sense working in fashion merchandising as well as Leyla’s branding and marketing experience in the hospitality industry. 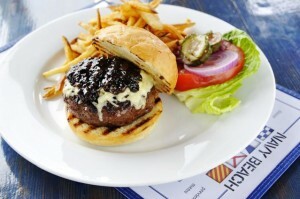 Entice Chef Paul Labue from The Beacon and Nick & Toni’s and you have the perfect restaurant storm. 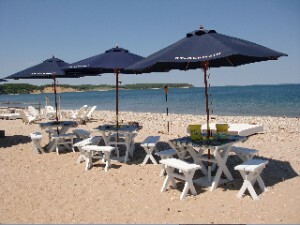 The two couples who met and bonded at a wedding in Harbor Island considered opening an eatery in New York City but given the ability to wave the magic beach wand the dream docked on Fort Pond Bay where you can arrive by car, boat, or even train to enjoy the view of Block Island Sound and Gardiner’s Island. With 200 feet of private beach, wall to wall windows opening onto the rare western water vista, an antique wooden bar, and live music, you’ll want to come early and often. There’s also a special kids menu for those who like to build a sandcastle by their picnic table while they wait for their Haute Dog. Due to the condiment non-discrimination act they can’t really say they’re anti-ketchup but the sentiment is that the local flavors are so fresh and full that you don’t want to drown them out. The Crab Cake is more crab than cake, and the Oysters fresh out of their beds. Even the famed Burger shines with the onion, bacon marmalade. The Calamari Salad has a bit of kick to it and the Truffle Mac and Cheese elevates comfort food to a new level. Cocktails get in on the fresh ingredients as well such as the Marganegra with Patron Silver, Chambord, muddled blackberries, and lime juice. 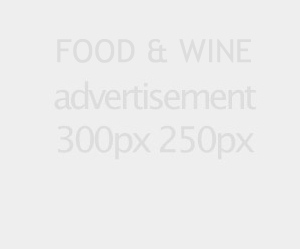 Both wine lovers and beer aficionados will appreciate a wide international array. 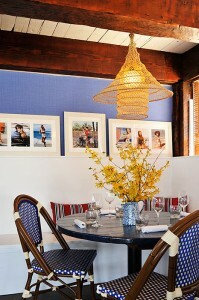 Navy Beach’s décor features white washed wood with bright blue nautical accents (think vintage 1950’s yacht club) with retro bikinis and fashion photographs adorning the walls. With an Argentinean/Brazilian bartender you know this is the place in the Hamptons to watch the World Cup from June 11 – July 11. Certain 10am and 2:30pm matches will be shown accompanied by special cocktails from Leblon and St.-Germain. Dan Bailey & Living Rhythm play live Saturdays in June from 6 – 8pm. Dads note that you get a free Bloody Mary or Budweiser on Fathers Day Sunday June 20 with lunch or dinner. They do recommend reservations which they take up to 7 days in advance. Open Dinner 7 days 6pm to midnight. Open Lunch Friday – Sunday noon to 3pm.